New Bolivia 2001 Patriotic Symbols unmounted mint. New Bolivia 1973 Bolivian Development unmounted mint. 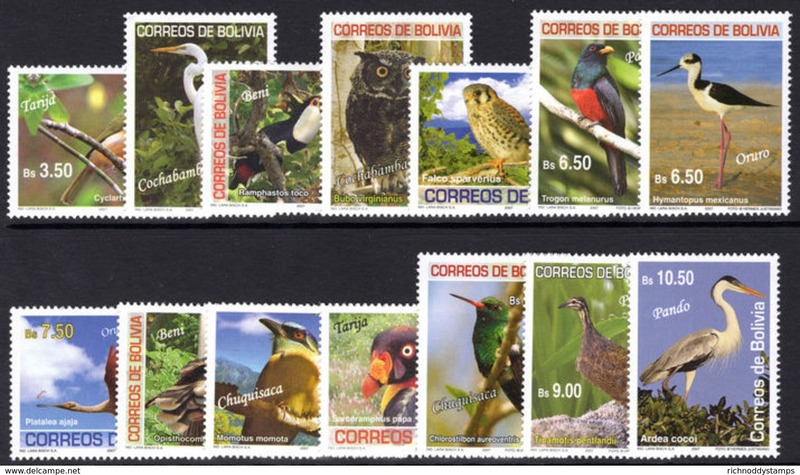 New Bolivia 2007 Birds unmounted mint. New Bolivia 2002 Butterflies and Insects sheetlet unmounted mint. New Bolivia 2001 Butterflies and Insects unmounted mint. 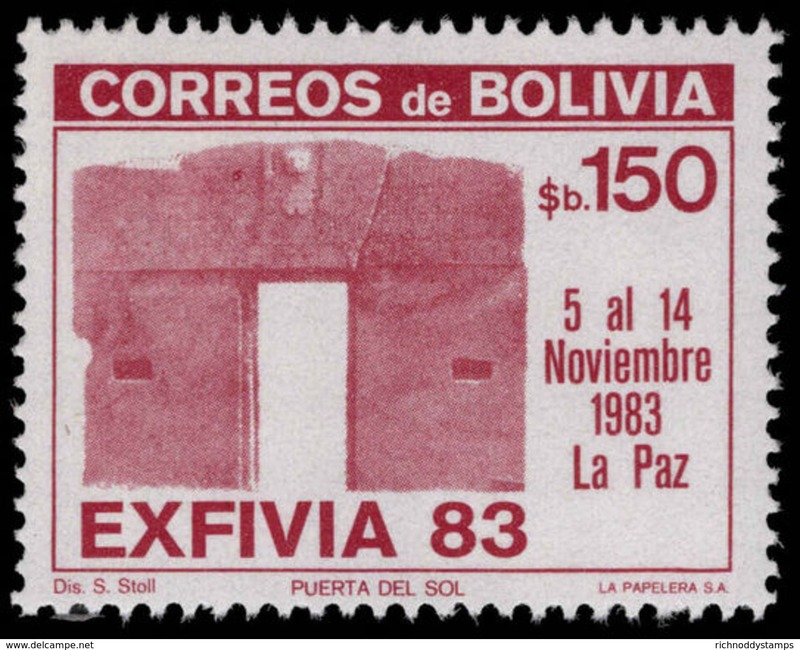 New Bolivia 1983 Stampex unmounted mint. New Bolivia 1975 150th Anniversary of the Republic unmounted mint. New Bolivia 1975 UPU unmounted mint. New Bolivia 1974 Battle of Ayacucho unmounted mint. New Bolivia 1974 Bolivian Air Force unmounted mint. New Bolivia 2007 Red Cross unmounted mint. 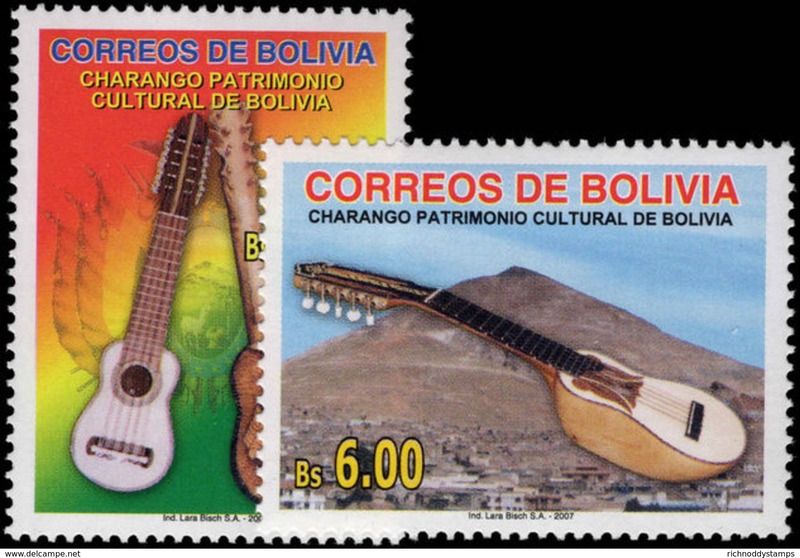 New Bolivia 2007 Cultural Heritage unmounted mint. New Bolivia 2007 Philatelic Association unmounted mint. New Bolivia 2007 Treaty of Rome unmounted mint. New Bolivia 2007 Lions Forum unmounted mint. New Bolivia 2006 Provisional set unmounted mint. New Bolivia 2006 Dogs unmounted mint. 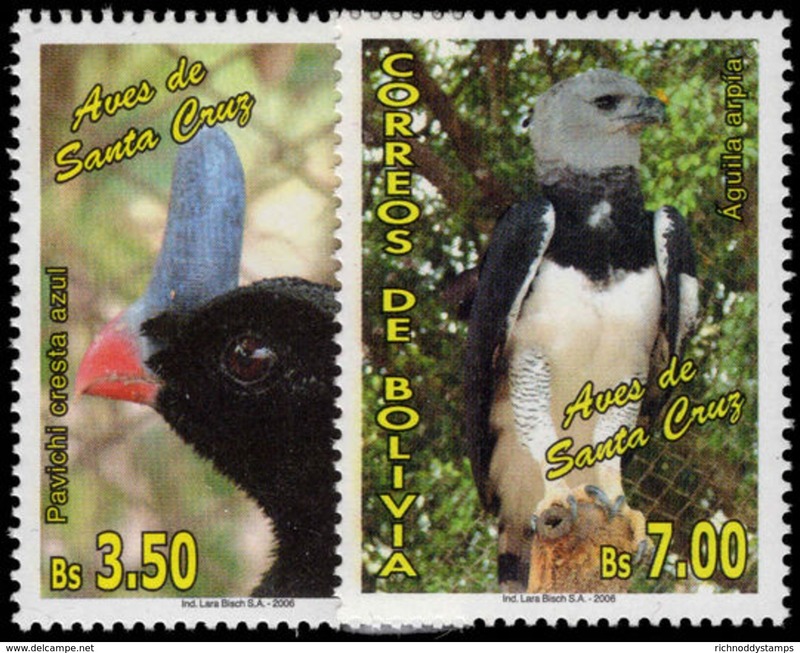 New Bolivia 2006 Birds of Santa Cruz unmounted mint. 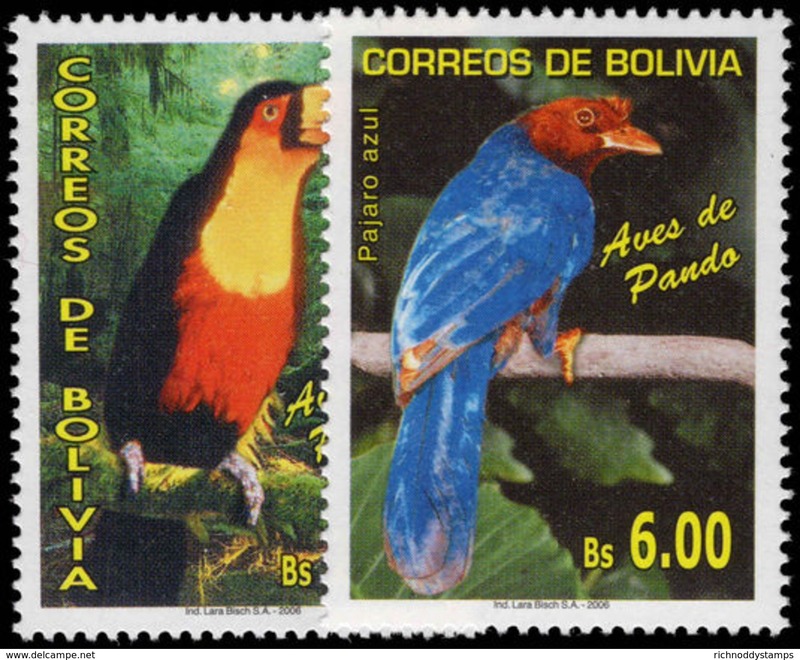 New Bolivia 2006 Birds of Pando unmounted mint. New Bolivia 2006 Manco Kapac unmounted mint. 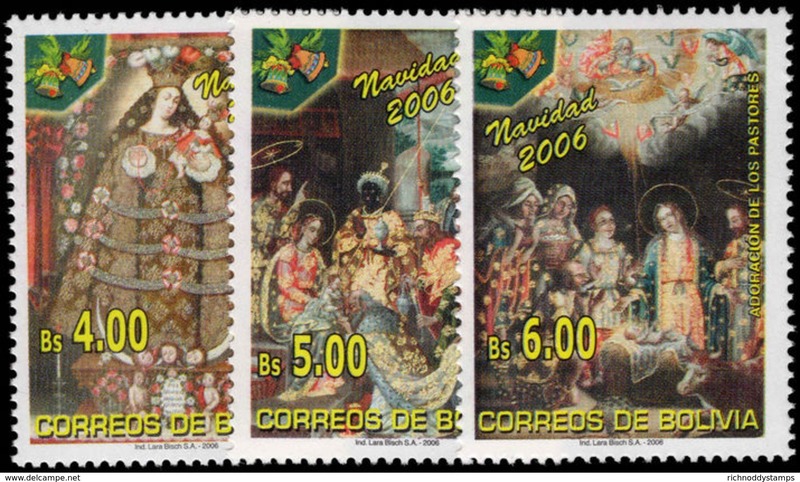 New Bolivia 2006 Christmas unmounted mint. New Bolivia 2006 Endangered Species unmounted mint. New Bolivia 2006 Energy Conservation unmounted mint. New Bolivia 2006 Deserts and Desertification unmounted mint. New Bolivia 2006 Bahia Harbour unmounted mint. New Bolivia 2006 400th Anniversary of Oruro unmounted mint. New Bolivia 2006 Franciscan Order in Tarija unmounted mint. 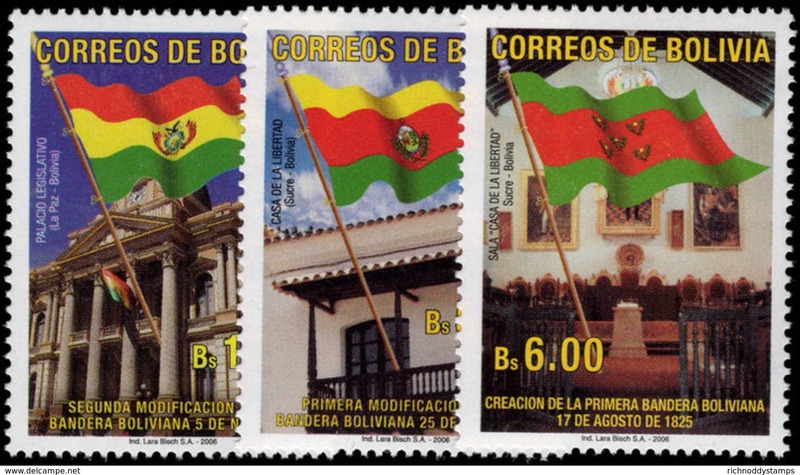 New Bolivia 2006 Flags unmounted mint. New Bolivia 2005 Infanteria Colorado Regiment unmounted mint. 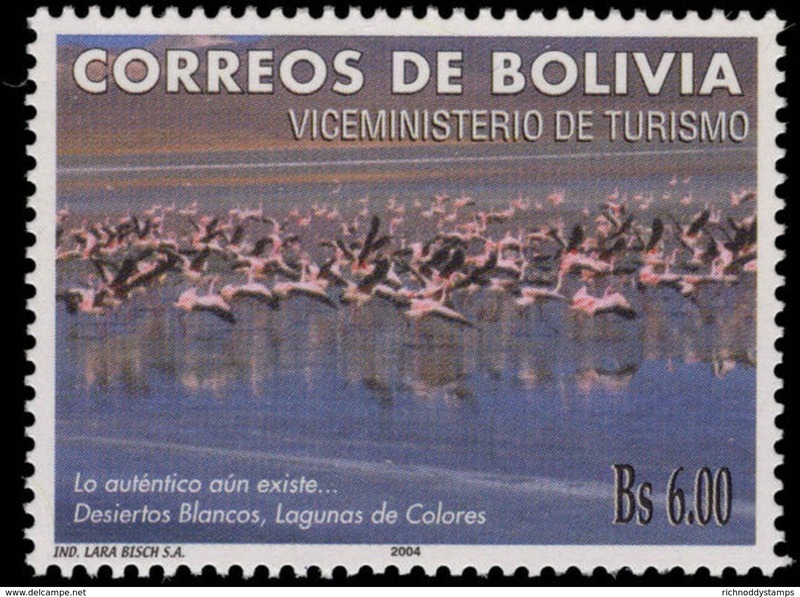 New Bolivia 2005 Tourism, flamingos unmounted mint. New Bolivia 2005 The Pacific War unmounted mint. 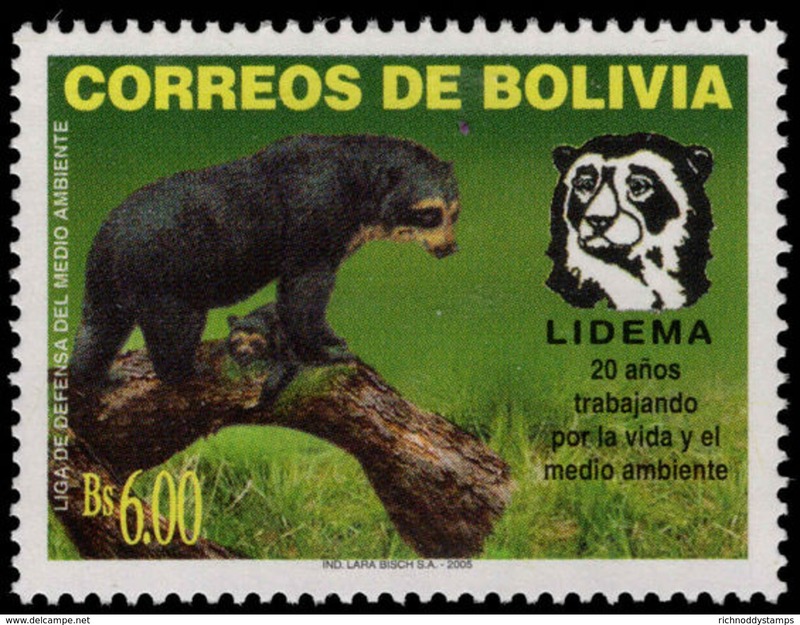 New Bolivia 2005 LIDEMA Conservation unmounted mint. New Bolivia 2006 ECOBOL unmounted mint. New Bolivia 2006 Bolivian Red Cross unmounted mint. New Bolivia 2006 Juan Evo Morales unmounted mint. New Bolivia 2006 Engineering University unmounted mint. 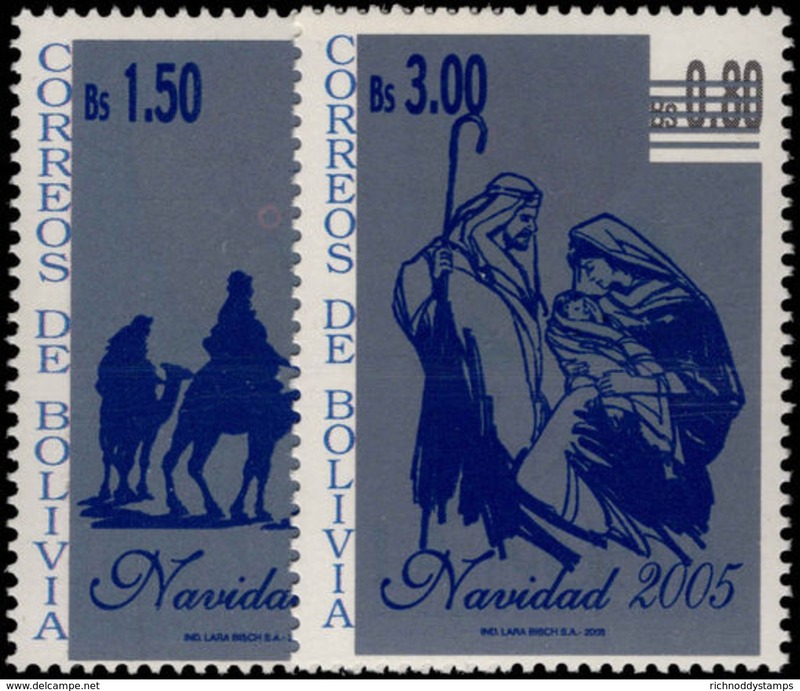 New Bolivia 2005 Christmas unmounted mint. New Bolivia 2001 Scouts unmounted mint. New Bolivia 1954 Agriculture Congress : Wheat Cow Peasant Set/2 IMPERF PAIRS, MH. New Bolivia 1954 Agriculture Reform : Wheat Cow Peasant Postage and Airmail set/5 IMPERF PAIRS, MH. New Bolivia 1930 1B Simon Bolivar Mint Pair, variety Imperf between stamp and margin. See text. New Bolivia 1955 Obligatory Tax 5B Aircraft, variety Imperf between Pair, MH – very scarce. New Bolivia c.1951 Post Horn Condor Bird –Obligatory Tax in unissued colour – proof probably. 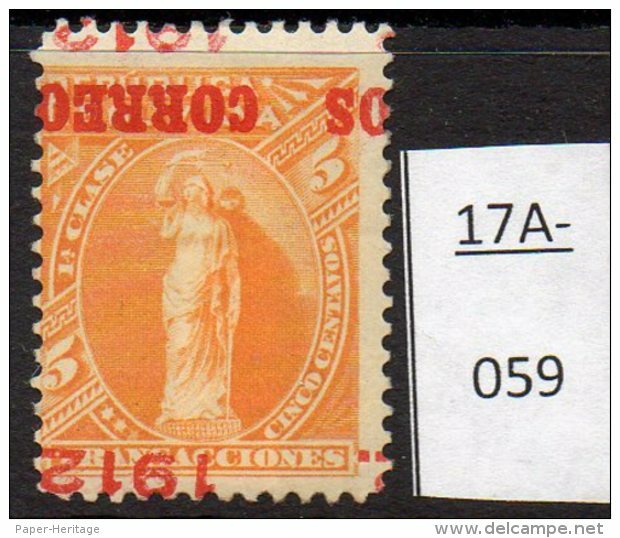 New Bolivia 1937 Sucre 10Bs/Bs.5- Surcharged in BLACK – MNH (gum marks) – Only 100 printed. New Bolivia 1925 Independence 25c Condor Bird IMPERF PAIR, one MH, one MNH. SG 187 variety. New Bolivia 1930 15c Air Aircraft Bullock Cart Colour Proof in Yellow on wove paper – scarce. 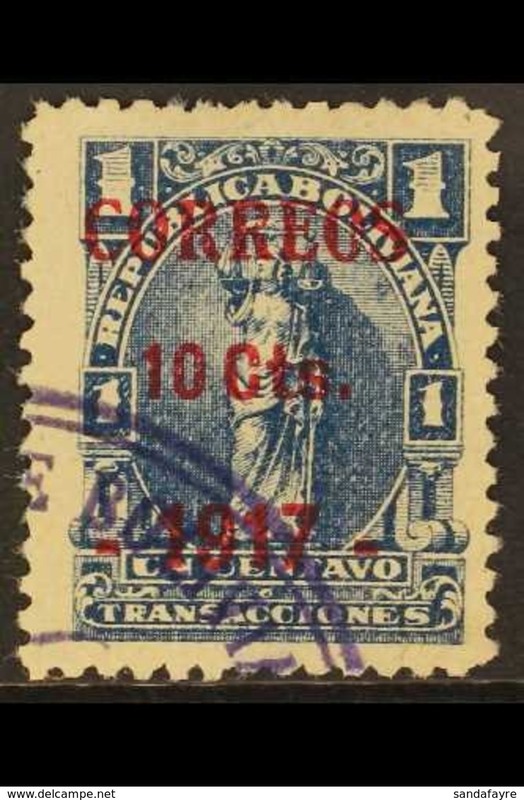 New Bolivia 1911 5c/2c Surcharge in BLUE, used. See text. New Bolivia 1930 Ship Boat Mountain Volcano ? Surcharge Double, BOTH INVERTED. MH. New Bolivia 1930 Ship Boat Mountain Volcano ? 25c/2c with Trial / Proof surcharge in BROWN. MH. New Bolivia 1930 Monolith 25c/½c : Surcharged BOTH SIDES, MH. SG 226 variety – RARE. See text. New Bolivia 1930 Monolith 25c/½c : Surcharge in Brown – Proof / Colour Trail. MNH. SG 226 variety. New Bolivia 1930 Monolith 25c/½c Surcharge Double, One Inverted. MH. SG 226 variety. New Bolivia 1930 Ship Boat Mountain Volcano ? 0.03c/2c Surcharge INVERTED MH – SG 225 var. New Bolivia 1930 Ship Boat Mountain Volcano ? 0.03c/2c Trial Proof Surcharge. MH – see text. New Bolivia 1930 Ship Boat Mountain Volcano ? 0.03c/2c Surcharge DOUBLE. MH – see text. New Bolivia 1930 Camacho 0.01c/2c Surcharge Double, One Inverted. MH. SG 224 variety. New Bolivia 1930 Camacho 0.01c/2c ERROR OF VALUE, 0.10 for 0.01. MNH. SG 224a. Scarce. New Bolivia 1930 Camacho 0.01c/2c Trial / Proof Surcharge in BLACK MNH. SG 224 variety. New Bolivia 1917 Parliament Type II FRAME OMITTED MH – see text. SG 148 variety. New Bolivia 1916 ½c Brown Monolith pair, Imperf between and with blank field MH. New Bolivia 1930 Airmail Aircraft Bullock Cart 3 Bs.- MNH IMPERF pair – scarce. 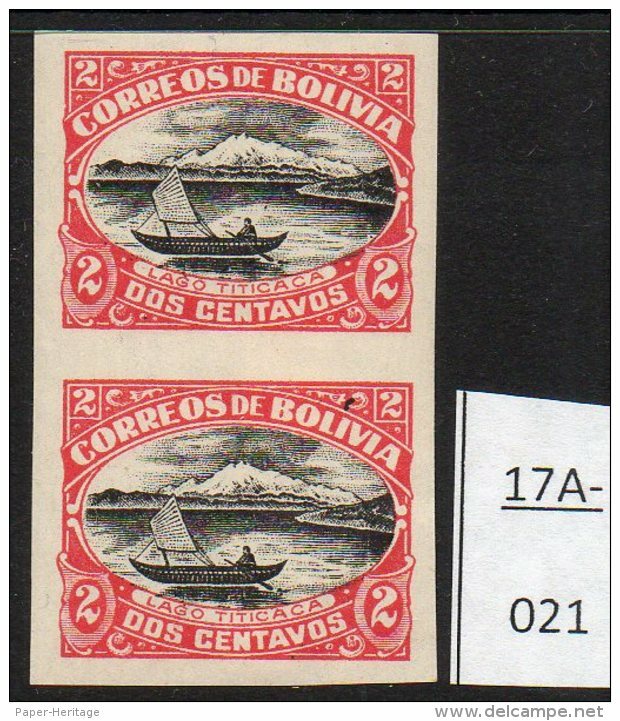 New Bolivia 1930 Airmail Bs 2.- Aircraft Steam Ship MH (2) : Normal Paper and Thick Paper. New Bolivia 1930 Airmail Bs 2.- Aircraft Steam Ship MH Imperf Single stamp. SG 250 variety Abart varieté. New Bolivia 1957 Legislative Palace Bs.1 surcharge Bs.600 in Red AND Black – MNH – RARE. New Bolivia 1957 Castilla Coat-of-Arms Alonso de Mendoza Bs.5000/Bs.10 Surcharge Inverted. MH. New Bolivia 1937 Airmail Aircraft Bs12/10c MH with Surcharge Inverted. Scott C57a. New Bolivia 1928 Arms Condor Bird 15c/50c on Perkins Bacon Ptg, Surch. Double, One Inverted. Used. New Bolivia 1928 Arms Condor Bird 15c/50c Perkins Bacon Ptg, Surcharge Double, used. SG 216b. New Bolivia 1928 Arms Condor Bird 15c/50c ABN Co. Ptg with Surcharge Inverted, used, pen cancelled. New Bolivia 1928 Arms Condor Bird 15c/24c with BLUE surcharge, MH surcharge Inverted. See text. New Bolivia 1928 Arms Condor Bird 15c/24c with RED surcharge, mint no gum, see text. New Bolivia 1928 Arms Condor Bird 15c/20c Waterlow Ptg with BLACK surcharge inverted, lightly used. RARE. 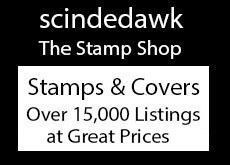 New Bolivia 1928 Arms Condor Bird 15c/20c Waterlow Ptg with BLACK surcharge, lightly used. RARE. New Bolivia 1928 Arms Condor Bird 15c/20c Perkins Bacon Ptg, var. BLACK surcharge. SG 211b MH. New Bolivia 1928 Arms Condor Bird 15c/20c ABN Co. Ptg, Surcharge in red Inverted. Mint No Gum. New Bolivia 1928 Arms Condor Bird15c/20c ABN Co. Ptg with unlisted BLACK surcharge. Used. See text. New Bolivia 1923 Arms Condor Bird ABN CO Ptg. 15c/22c Surcharge in Trial Colour RED. MH. SG 168 var. New Bolivia 1924 Arms Condor Bird 15c/10c ABN Co Ptg, Surcharge Double, One Inverted. Used. New Bolivia 1924 Arms Condor Bird 5c/1c Surcharge Inverted. MH. 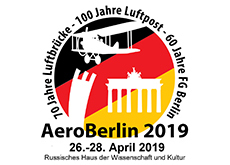 SG 165a. 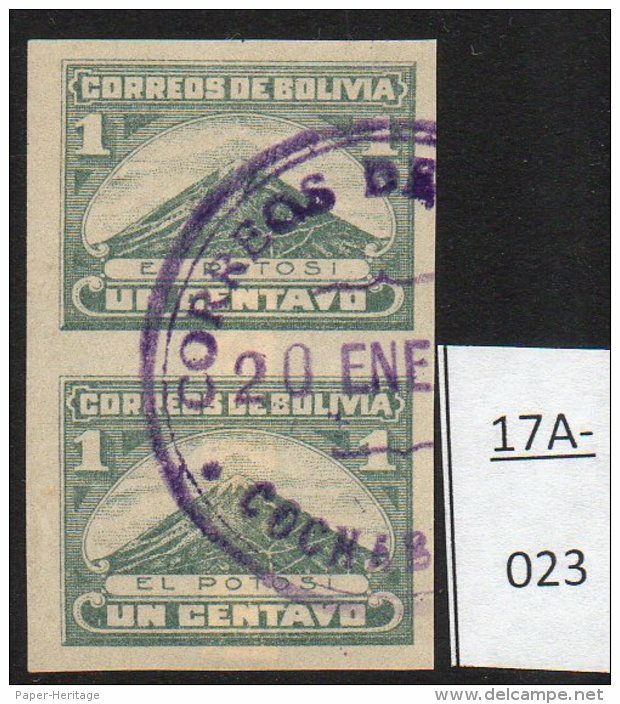 New Bolivia 1924 Arms Condor Bird5c/1c Surcharge Double, One Inverted. MNH – Unlisted variety. New Bolivia 1924 10c Arms Condor Bird Redrawn Perf 13½ MH key value, scarce. SG 160. New Bolivia 1916/18 5c Mountain El Illimani (Types I and II) both in mint IMPERF blocks/4. Scarce. New Bolivia 1917 Mount El Potosi Volcano IMPERF pair used (cto) Scott 112a SG 143a. Unusual used. New Bolivia 1954 Congress Airmail set/2 in MH IMPERF pairs. New Bolivia 1953 Revolution Airmail set/2 IMPERF, Volcano Rifle. SG 590a/91a (unpriced in SG). MNH. 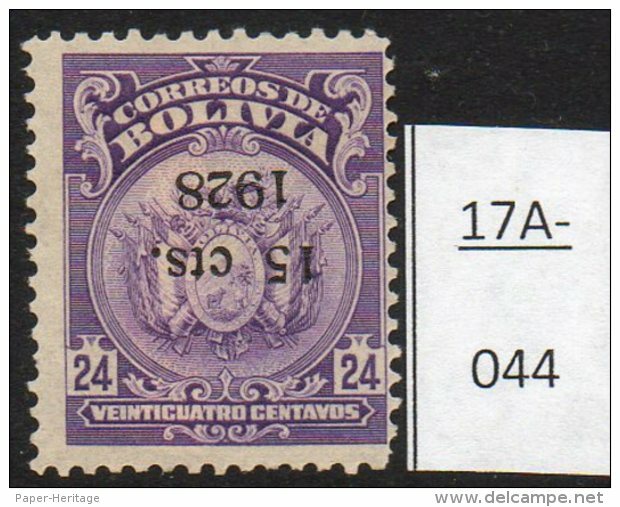 New Bolivia 1955 Obligatory Tax 5b/3b bistre post-horn varieties – see text. Used.